Abolish the penny: The United States should follow Canada’s lead and ditch one-cent coins. The United States should follow Canada’s lead and ditch one-cent coins. One United States dollar is currently worth almost exactly 99 Canadian cents. It won’t be long, though, before it will be impossible to put 99 cents in your pocket north of the border. That’s because Canada is poised to implement a longtime dream of American budget wonks (and Aaron Sorkin) and withdraw the penny from circulation. The basic problem with pennies is that they cost a lot of money for the government to make. Normally, minting coins and printing bills is a profitable undertaking for a government running a fiat currency. Citizens use money to conduct transactions with one another, and ultimately to pay taxes. But as long as that money is sitting around in pockets and sock drawers, it’s as if the government has received an interest-free loan. After all, the resources needed to produce a coin or a piece of paper with Alexander Hamilton’s picture on it are pretty trivial. But in the case of the penny, the problem for the government is that the actual value of the thing is trivial as well. Since 1900, the price level in the United States has increased 25-fold—in other words, a penny in 1900 had about the same real purchasing power as a quarter does today. Even today there’s not much you can buy for 25 cents, but put a few quarters together and you’ve got yourself some time in a parking space, a load of laundry, or a soda from a vending machine. A penny, by contrast, has almost no purchasing power. That means that the real resources involved in producing one, though hardly enormous, are big enough to make it unprofitable. Ten years ago, a penny cost slightly less than one cent to produce, but rising commodity prices mean there are now more than 2.4 cents’ worth of metal and labor in each one-cent coin. In 2011, the net cost to the taxpayer of minting pennies was a bit over $60 million. In the scheme of things, that’s not all that much money, but it’s money that’s worth saving. Budget-induced alterations in coinage are hardly a new idea. 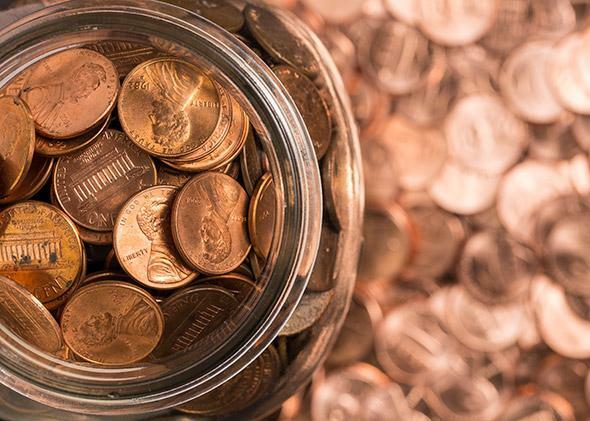 People often think that pennies are made of copper, but that hasn’t been the case for some time. From 1864 to 1942, the penny was bronze—i.e., an alloy of 95 percent copper with 5 percent tin and zinc. But in 1943, the powers that be wisely decided that beating Hitler was a higher priority than minting low-value coins. Copper shortages had been ameliorated by 1944, but rather than returning to bronze we moved to a tin-free copper/zinc brass alloy. By 1946, wartime austerity was on its way out and tin got back into the coins, only to be removed again in 1962. The so-called “Great Inflation” that proceeded over the next two decades created the original version of today’s anti-seigniorage problem. Suddenly the country was putting more than one cent’s worth of bronze into each penny. The solution was a shift to today’s penny, which consists of a 99.2 percent zinc core sheathed in a plating of full copper. It was a clever idea, but the price level has more than doubled since 1982, when the switch was last made. In its Fiscal Year 2013 budget proposal the Obama administration asked for “increased flexibility for the U.S. Mint in coinage” to allow for yet another switch and help us evade the high price of zinc. Since the zinc lobby itself is the main impediment to penny abolition, as long as we’re taking them on we might as well go all the way and just kill the coin off. This is especially true because the budget cost of the penny is in some ways the least of its problems. The U.S. government didn’t make steel pennies in 1943 because it needed more money, but rather because it wanted more copper available for war production. The same basic issue applies today. Some forms of government spending can stimulate economic activity, but taking two cents’ worth of zinc and stamping it with a one-cent mark just deprives the rest of the economy of potentially useful metal. Consuming commodities to create quarters performs a valuable service by giving us a useful medium of exchange, but pennies are at least as much a nuisance as a convenience. The main case against scrapping the penny—mounted by Eric Wen at the New Republic, citing research from Penn State’s Raymond Lombra—is that firms would round up when setting prices, and this would disproportionately hurt the poor, who are more likely to use cash. That’s likely true, but on the upside, prices should also get “stickier” in the face of inflation. In other words, 99 cents might be rounded up to a dollar this year, but they’d then stick at a dollar even in the face of 2 percent inflation before rising by five cents a few years down the road. Any positive or negative impact on pricing, then, is only going to be temporary. Meanwhile, complaints that money-saving measures may hurt the poor should be put in perspective. Right now, Congress is cutting spending on programs aimed to save poor children from brain damage induced by lead poisoning, compared with which, going penny-free looks like a delightful form of austerity. As a bonus to help tide people over, Congress could declare that, as soon as new pennies stop being minted, old one-cent pieces would instantly be worth five cents each. Given the currently depressed state of the economy, that would work as a mild form of instant stimulus. People would be inspired to scrounge around their couch cushions and change jars in search of newly valuable pennies, and the pace of overall spending would get a little boost.